This one pot Veggie Korma Curry is absolutely loaded with veggies like zucchini, bell pepper, cauliflower, carrot and onion. Everything is cooked in a flavourful curry based cream sauce dotted with cashews for extra flavour and texture. You can add as little or as much spice as you like and customize to your taste. So good and a favourite around here! Who needs take out when there’s this? Hey you guys! What’s up? So, we had quite the wind storm around here this past weekend. There were sustained winds of over 100km for about three hours and even reports of winds at 180km!! There were power outages and everything. It was unfortunate, too, because our city was hosting the Canadian men’s curling championship so I’m sure there were lots of visitors to our province; they got the pleasure of experiencing the lovely weather we were having #sarcastic. On a positive note, I guess it makes for quite the little story, right? So, mother nature, where’s spring? I’m done with all this awful weather. What was it like in your neck of the woods? Anyways, onwards and upwards. Let’s talk food. My favourite topic! And I have a super flavourful one for you guys today – Veggie Korma. There’s a local Indian restaurant around here that has a vegetable curry with veggies, similar to this recipe. The thing is, when we have gotten the dish in the past, while it is always tasty, sometimes the sauce to veggie ratio is off, ya know? While I do LOVE that sauce (helloooo cream), especially when I use rice to soak it all up, I do want substance, i.e. veggies. And, plus, you know that homemade is always best. What Goes In Vegetable Korma Curry? Can I make this a Vegan Vegetable Curry? Yes! Absolutely! Just sub coconut milk for cream. Prep in advance! Everything happens relatively fast when you are cooking it so I would suggest having all your veggies cut and ready to go so that everything moves along swiftly….meaning you get to have this in yo belly faster! Don’t have all the veggies on hand? No worries! Just use what you’ve got! If you have a little more bell pepper, just add a little more to replace what you don’t have. Like things more spicy? Add a little more chili. And if you like less, add less or omit altogether! Once all of this was cooked, I garnished with a bunch of cilantro, but if you aren’t a fan, feel free to leave out or use parsley if you want that extra colour or even some chopped green onion. Remember, judgement free zone around here – whatever makes dem taste buds happy! I could seriously face plant in this dish, you guys. And that creamy curry based spicy sauce? Pour it on me. I’ve made this Veggie Korma a bazillion times and it is always a favourite. There’s absolutely no meat in here and, honestly, you are not gonna miss it one peck. Once you’ve made this recipe, I’m sure you’ll make again and again. So much better than takeout and you get to eat at home in your comfy clothes. Oh, by the way, this is awesome with a nice cold beer…..just sayin’. Hope you love this Veggie Korma as much as I do, you guys! Let me know if you get to try! This one pot Veggie Korma Curry is absolutely loaded with veggies like zucchini, bell pepper, cauliflower, carrot and onion. Everything is cooked in a flavourful curry based cream sauce dotted with cashews for extra flavour and texture. You can add as little or as much spice as you like and customize to your taste. So good and a favourite around here! Who needs take out when there's this? In a large pot (dutch oven), heat oil on medium low. Add onion and cook for about 5 minutes. To onion, add garlic, ginger, chili, potatoes and carrots. Cook 2 minutes. Push onion mixture to one side of pot and add tomato paste and cook about 1 minute. Stir to combine everything. Add curry powder and stock and cook an additional 12-15 minutes (uncovered) until potatoes and carrots are tender and stock roughly reduced by half. Add cauliflower, bell peppers, cream, salt, black pepper and cashews. Cover, simmer on low for 10 minutes. Add zucchini and cook 5 minutes more. Finish with cilantro and additional chili (if desired). Enjoy! To make cauliflower rice, simply place cauliflower florets in a food processor and blitz until it has a 'rice' consistency (i.e. broke down), place in a large microwave safe bowl with a tbsp. of coconut oil and salt to taste ( I use about 1/4 tsp), cover with plastic wrap and cook on high for about 8 minutes. Carefully remove from microwave and uncover (be careful as there will be steam), add in 1/3 cup unsweetened shredded coconut (optional) and stir to combine. Done! Wow, this looks fantastic. I love Indian food and veggies, and that sauce! I agree, I could do a face plant in this too! All the veggies, the cashews and the warm curry, what’s not to love. This looks soooo good. Definitely the best way to warm up in the midst of a storm. Thanks so much, Natalie 🙂 Happy weekend! Thanks so much, Natalie 🙂 ! Gee, thanks so much, Amanda!! I love Indian food too and could pretty much eat on the regular 🙂 Have an awesome weekend! A great combo of veggies – and I especially like cauliflower! Of late, have been reacting to tomatoes, so am pleased there is only a bit of tomato paste – yay! Temps in southern Ontario are below seasonal – will warm up my tummy with veggie korma! I love cauliflower a lot too – one of my favourite veggies! We are still not having warms temps here in NL – fingers crossed for soon 🙂 Thanks so much, Diane! Oh my! This is right up my alley! I love Indian food, and I love my veggies! What a beautiful dish. Thank you so much, Gabrielle 🙂 !! It’s a favourite in our home! Wow! She (yes, i named your food) is a beauty. Love the veggi combination. I need to get my curry game on over here in LA. It is funny because we are nestled by Little Tokyo, Korea Town, Little Armenia, and Thai Town, but geeze I still am so gun-shy with curry. This is encouragement. I want to try it! Hahaha! I sometimes name food too, lol 😉 Hope you give this one a try; it’s a favourite around here 🙂 Thanks so much Cindy! Totally awesome & pinned! This post reminded me of living in Estes Park (aka Rocky Mountain Wind Central) a few years ago. The only decent restaurant in town (besides the Stanley’s, where Chris worked:) was a Nepali place. We used to get korma take out from there and enjoy it while guessing if the wind will topple a pine tree and smash it against our house. So happy to not live there any more! And your comment about the veggie to sauce ratio is right on! Cheers! We were RIGHT in the middle of the blizzard this past week – there is nothing like a snow day to make you want to fire up the kitchen! This veggie gorgeousness is definitely getting pinned and made. Stay warm my friend! I totally agree….no better time to cook than when it’s snowing outside….speaking of which, we have snow today – the first day of Spring. Ugh! Thanks so much for the kind words and Pin, my friend! What bad timing for a storm with the Canadian men’s curling championship on. Can’t wait for spring either but we have been treated rather well weather wise here in London and I very much hope that it continues that way. Love Korma and your vegetarian version looks and sounds delicious, such a nice way to get more veggies on the table 🙂 Have a great weekend! Those winds! It must have been absolutely howling inside your house…Come on spring!! This loaded-with-veggie dish is perfect, and all of those spices! It seems like every season has a dish like this that I love and this one is just right for waiting out that last little bit of winter. OH MY GOSH on those winds!! I have an extreme dislike for strong winds because of dealing with hurricanes while growing up in South Fla. They were always so scary as a kid. THIS IS SO PINNED! I love veggies in any form but I’ve never made veggie korma before. It looks delicious! I can’t wait to try it :). chicken korma is one of my go to’s when i get indian food! but i love the sauce (i’m convinced that i could live off of the sauce + naan for the rest of my life) and could care less about the chicken. 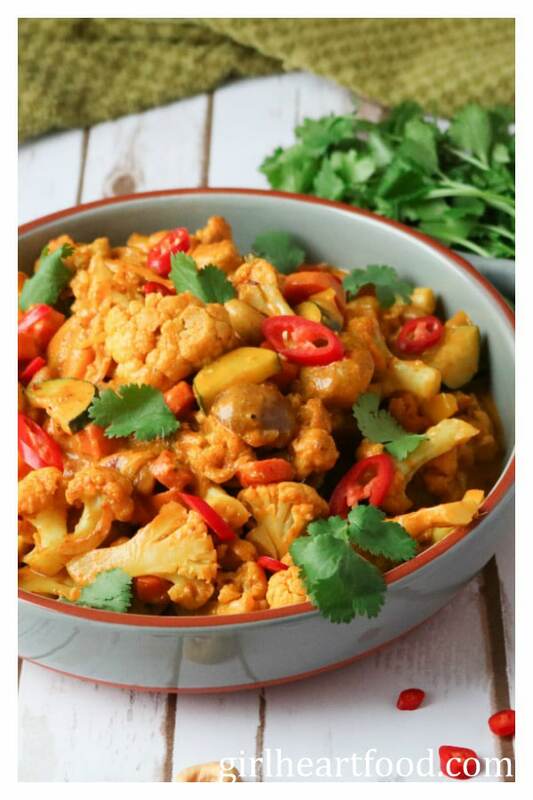 veggies sound a lot tastier (; will have to try this one out at home since i’ve never seen a veggie korma at a restaurant before! I totally know what you mean! I love the sauce too, especially when there’s naan involved 🙂 Thanks so much for stopping by, Heather! Hope you enjoy the recipe! Such beautiful colors!! I love this kind of dish, I make something similar quite often using whatever veggies I happen to have. I just wish my kids would finally understand how amazing cauliflower is, at the time being they mostly end up eating rice with a bit of sauce and maybe the peppers and the carrots in the dish (if I’m lucky). Yum, this dish sounds so tasty! I love cashews, especially in veggie dishes. It just gives it such good flavor and crunch. Glad you got through the wind storm unscathed! Here is Southern California, we are in full blown spring mode already (it’s supposed to be 80 degrees here this weekend!!) and honestly, I could do with a little more winter weather before the heat sets in. This looks delish! I’ve never made veggie korma before, but I love how hearty and flavorful it looks. I think it needs to go to the top of my to-try list. Pinned! That’s some wind storm! I always like when the power goes out…..for about the first 30 minutes. Then I’m like…..Where’s that dang power! 🙂 This veggie dish is just what I need to get me through this winter slump! I am ready for spring, but the weather just isn’t cooperating! I completely know what you mean, Kathy!! For the first little bit of the power going it’s kinda nice and then not so much! Too funny! Thanks so much 🙂 Hope your week is going great! Veg Korma is my FAV! I make it at home all the time! I love that it’s always a little different each time I have it somewhere new, or even just as the veggies get swapped out with the seasons. And I want it with all the spice!!! Lol. And weather.. well I was in Florida this week, but I’m headed back to the frozen tundra now. Sob ? 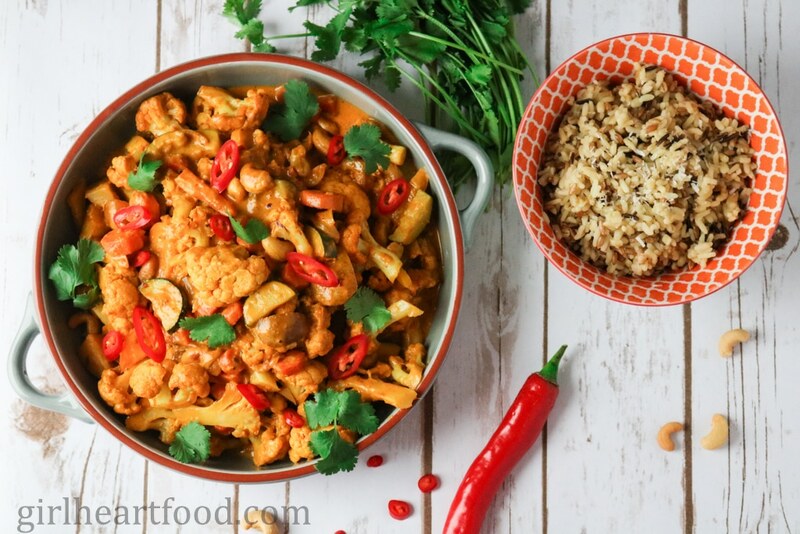 I have never tried Veggie Korma Dawn, but what an incredibly delicious looking meal! It’s loaded with all ingredients that I love. So hearty and delicious and destined for our dinner table very soon! Pinned! Thanks for sharing. Hope you have a great week! You’re going to love it, Mary Ann! I know we do 🙂 Thanks so much, my friend! Have a great week too! This looks delicious Dawn! Perfect for our new-ish Meatless Mondays, an attempt at a relatively healthier lifestyle (I mean, we can eat cookies all day but we decided we prolly shouldn’t!). I get your sauce – veggie ratio issue. I’ve had dishes like that too. But this looks perfect! And yeah, we heard about your bizarre weather on the news. Stay warm! We’re all gearing up for a snowstorm tonight-tomorrow over here. It stopped snowing though…so maybe the news people jinxed it away! I’ve never heard of korma, but I’m all about veggieful dishes. This colorful bowl of plants would make a great family dinner. WOA – winds with speeds of 100km and 180km is crazy! I’m glad y’all are safe! While we down in the South don’t have it hardly as bad as y’all do – the temps seem to have taken a nose dive this weekend – so so cold and rainy and gloomy – I woke up this morning and thought I was in Seattle! Yikes! And while I’m not to fond of this crazy weather, I sure do ador veggie korma! When we lived in Abu Dhabi, there was a small Indian store that sold the best korma – only they diced the veggies so super small that it was hard to make out which was which! Dawn, your’s looks perfectly chunky and delicious! Happy Monday to ya – I’m heading over to check out your Shepherd’s Pie now! Ugh, branches on trees are scary when there’s wind!! I hope that’s the last of the crappy weather for a while and bring on Spring!! I knew you’d be watching the curling 🙂 Hope you get a chance to try the recipe! Thanks so much and have a great week, my friend! You must’ve gotten our wind storm weather, because we had horrible winds on Tuesday and Wednesday! Around 35 mph (not sure what that is in km?) and just plain awful. Our winter has been pretty mild here though, so I really can’t complain about the temps, though we did get some snow last night. But I am ready for spring and colorful veggies like this dish! Such a pretty recipe, Dawn! I love all of the gorgeous colors and flavor with the curry and spices. I think I could make a meal out of this! Perfect for thoughts of spring, too. Pinned, of course! Hope you’re having a good Monday! I think 35 mph is about 56 kpm. The wind definitely is aweful! Spring can’t come soon enough and when we get the odd sunny day lately, it makes me wish it was here already. This veg korma happens to be one of my favourite things to make (and eat). And though there’s cream in there, it is loaded with veggies so they cancel out the cream, lol 😀 Appreciate the kind words and Pin. Happy Monday, my friend!